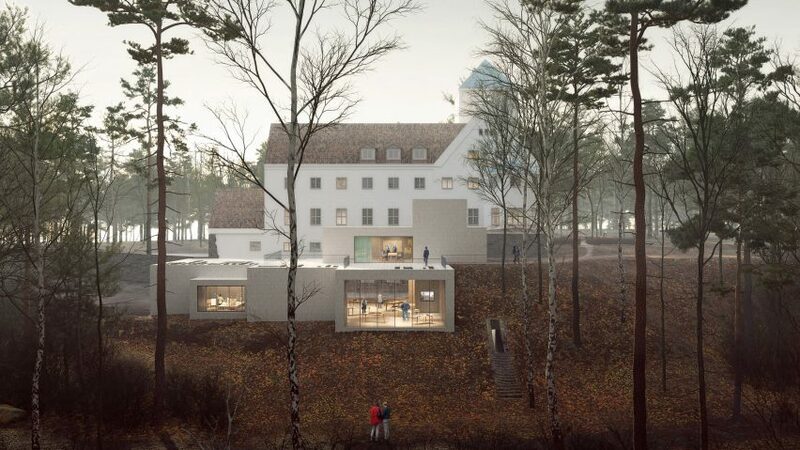 Transborder Studio has unveiled plans to add a contemporary extension to a Holocaust research centre in western Oslo, Norway, composed of box-shaped volumes that will be built into a hill. 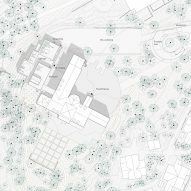 Local architects Transborder Studio were charged with designing the extension to the Villa Grande on Oslo's Bygdøy peninsula, following an invited competition that included practices Snøhetta, Jarmund Vigsnæs and DRDH. The Center for Studies of Holocaust and Religious Minorities took over the historic building in 2006, and is now expanding to make room for extra learning rooms and exhibition spaces. Since its construction in 1917 the property has had a variety of uses – once the private home of Nazi prime minister Vidkun Quisling, it later became a headquarters for allied forces after World War II, then an ambassador's residence and finally a nursing school. "This faceted legacy [was an] important contribution to the appearance of the villa, [which] arose from a dark and hateful ideology," said Transborder in a statement. 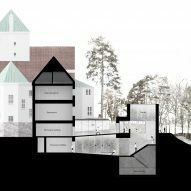 [The extension] demanded a critical adaptation where one had to have a conscious attitude to historical layers of the building." 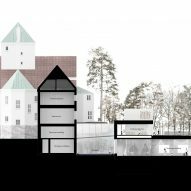 The practice want the extension to echo the "castle-like massing" of the existing building, which was originally designed by Norwegian architects Christian Morgenstierne and Arne Eide. It will comprise of a stack of rectilinear volumes, which will be inset into an adjacent grassy bank. 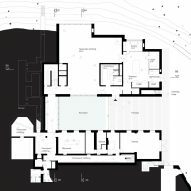 The lower level will play host to workshop areas and large, open exhibition spaces that the architects hope will act as a "counterweight" to the centre's heavy subject matter. 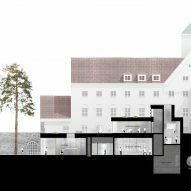 Its roof will be planted with greenery to ensure that the new wing is "in dialogue with the garden, villa and surrounding landscape". 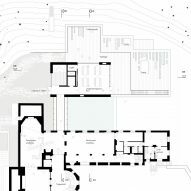 Several of the spaces – including the handful of study rooms upstairs on the first floor – will be fronted by large panels of glazing that provide views of the tall trees that are dotted around the site. Reflective pools will also run from both levels of the extension towards the main building, offering further spots for contemplation. At the end of 2017, architects David Adjaye and Ron Arad were named as the designers of a Holocaust memorial for a park near London's Houses of Parliament, which will feature a subterranean learning centre. Last year also saw the completion of Studio Libeskind's Holocaust monument in Ottawa, Canada, which is formed from tall concrete walls laid out like a warped Star of David.